Happy Thursday! I cannot believe that it is already the end of the week! Four day work weeks always seem to fly! This week, Elle and I are styling fringe! Turns out I do not own that much fringe! Guess I need to fix that! 1. 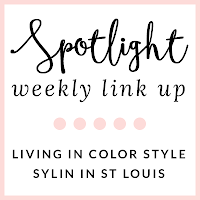 We kindly ask that you follow the two hosts: Elle from Living in Color Style, Jacqueline from Stylin' In St. Louis, and our co-host Ana of Northwest Blonde via Bloglovin or GFC. 2. Use the button provided on Elle or Jacqueline's side bar or link back to the link-up on your blog. 3. Enjoy reading other blogs and make new blogger friends! Spotlight: Our spotlight this week is Debbie of Fashion Fairy Dust! 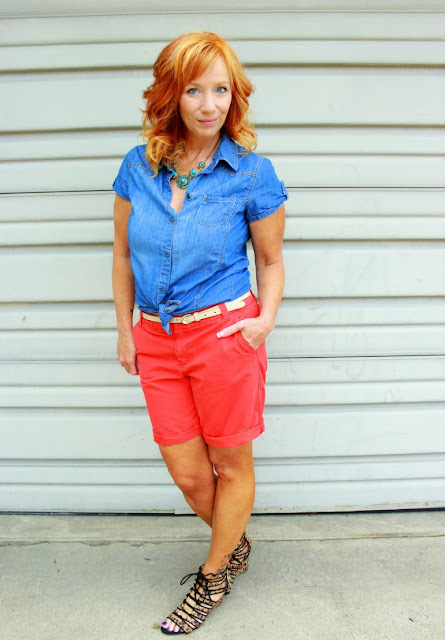 We love her red and chambray color combo! It is such a classic that always look fabulous! The pop of leopard of the perfect touch! Be sure to check out her blog! 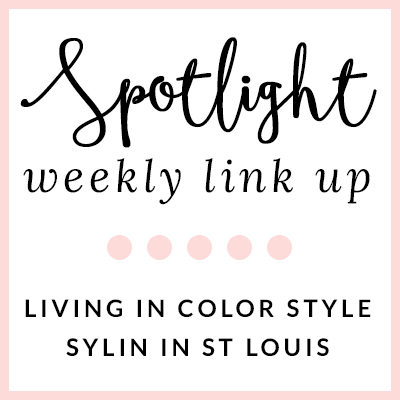 Next week: Next week our spotlight weekly theme is NEUTRALS! Thanks for linking up! See you next week! Loving the fringe trend for fall. You look great! Love the simplicity of your look, very chic! So chic in black and white, babe! I need more fringe in my closet too! Love this black and white look! That b/w look is great. I just got a GiGi clutch and love it! I love these basics! Such a timeless outfit that always works. You look amazing girl! Love that necklace! AHH! A girl after my own heart! 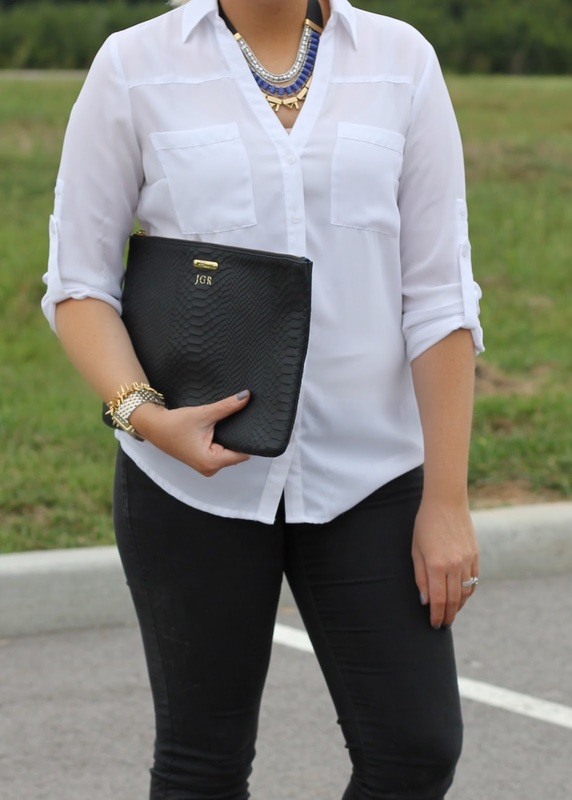 Love this chic look, and the classic color pairing of black and white. So pretty! The accessories totally make this outfit, too! So simple but so chic! This outfit is just beyond fab with the great accessories! 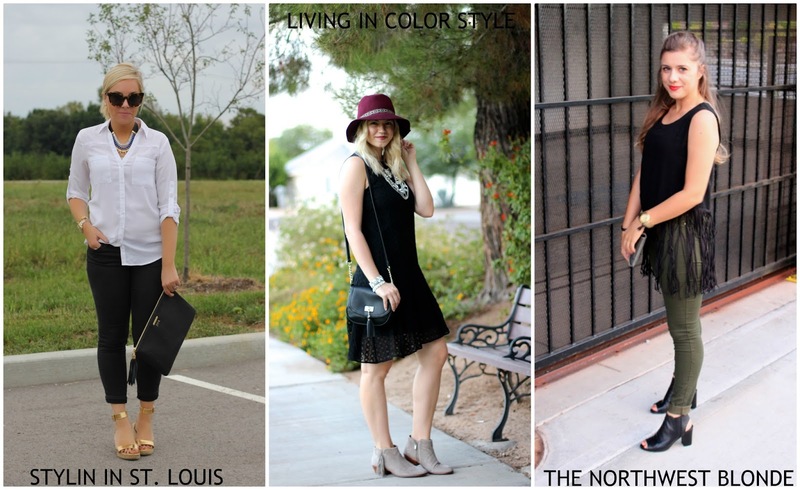 Would love for you to stop by & join TBT Fashion link up. All three of you look beautiful. I love all of you all's fringe pieces. Your outfit is simple, clean and gorgeous, Jac! Can NEVER go wrong in B&W with some fringes on the side! If you still haven't - come join the huge GIVEAWAY I am hosting for the THE KEWL SHOP till Sept. 12 where a $150 dress value is at stake! I love your sunglasses and clutch! Looking lovely in this classic combo of black and white! Lovely, classic look! Love those shoes! Love the look, really classy and sophisticated! love the sunglasses you are wearing! such a cool look to transition into fall time! This is SO chic!!! I love, love, love how well the accessories tie in with the gold sandals and the gold on the Gigi New York bag! I don't really own any fringe either and I definitely need some!! It's such a fun trend! Classic and stunning! Love the pop of gold in your heels!